Approximately 7 years ago, prior to the release of Baghban (2003), I remember an interview with Ravi Chopra the director of the film. In the interview he said, his father, B.R. Chopra "got the film's concept in his mind thirty years previously, when he paid a visit to Copenhagen, Denmark. He came across a retirement home, where he met a woman who sorrowfully told him how her own children left her there and hadn't even paid a visit to her since." Thirty years earlier would suggest his visit to Copenhagen was in 1973. Well, in 1976, Ravi Tandon made a film titled "Zindagi" with Sanjeev Kumar and Mala Sinha. Now, Zindagi has the exact same storyline as Baghban - does that mean Ravi Tandon went to Copenhagen three years later and spoke to the same woman? 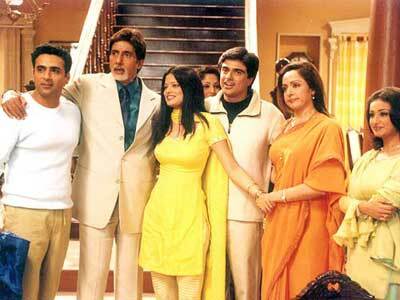 According to Ravi Chopra, it took the Chopra's 30 years to make Baghban due to other commitments. In countless interviews they made it sound like Baghban was B.R. Chopra's dream project, something that was very unique, original and had never been showcased on Indian movie screens. The truth of the matter is, by the time Baghban did make it to the screens, this storyline had been offered to the audience a countless number of times. In fact, both Baghban and Zindagi are a rip-off of the american classic Make Way for Tomorrow which released in 1937, decades before either of these films were conceived. Baghban, is a good film. But instead of suggesting it was something original, the makers should've said it's a good story and not make it seem like it's the most original work ever produced. Then at least the audience won't be disappointed when they realize it's another remake. I suppose if Indian filmmakers were as good at conceiving storylines as they're at marketing them perhaps we would get some interesting stories to see on screen. But, until that day comes, I guess we're stuck with rehashes and remakes of old stories. In case you're wondering why I'm writing about this now (7 years after the release of Baghban), it's because I recently saw Zindagi and it reminded me of Baghban. Haha! Watching Zindagi now and Baghban is a ditto copy - Indian movies are soooo unoriginal it's funny beyond words.